Sunday night is mask night. I can’t say I have a fave. I just use whatever I have at hand. A couple of Sundays ago, that was Magicstripes Hyaluronic Intensive Treatment Mask. Did it impress me enough to buy it again? Mmmmm…. Think of hyaluronic acid as a magnet. When you put it on your skin, the magnet starts looking for moisture in the air. When it finds it, it attracts it into your skin and keeps it there. Hyaluronic acid is so good at this, it holds up to 1000 times its weight in water! Do you know what all that moisture means for your skin? Softer texture. Brighter complexion. And the plumpness! That alone makes your wrinkles look smaller. P.S. Hyaluronic acid isn’t the only moisture magnet in Magicstripes Hyaluronic Intensive Mask Treatment. You’ll also find glycerin, aloe vera and many others here. You’ve probably heard that collagen can’t penetrate skin, right? That’s sort of true. Collagen is a big molecule that can’t get through the skin’s protective barrier. That’s why brands chop it down into tiny bits. They call these bits hydrolysed collagen. But even if these tiny bits of collagen get through the skin, it doesn’t mean they do anything. You see, it’s not enough to give skin collagen to make it boost its natural collagen. The extra collagen must integrate into the skin’s own collagen framework to affect it. Hydrolyzed collagen is too small for that. Does it mean it does nothing at all? Nope. It still hydrates skin. Just don’t expect anything more than that. Magicstripes Hyaluronic Intensive Treatment Mask is divided into two parts: one for the upper part of the face and one for the lower part. In theory, this makes it easier to fit the mask properly all over your face. Problem is keeping it there! I have to lie down when I use this mask or it slips off my face! I don’t mind too much. It’s a good excuse to catch up with a good book. 😉 Besides, it feels comfortable on my face and doesn’t rip off when you apply it (some sheets are so flimsy!). Half an hour later, I take it off and gently pat the remaining essence into my skin. It takes only a few seconds. The sheet is drenched in it but once I remove it, not much is left on my skin. Mind you, it may just be that my dry skin has lapped everything up pronto. Either way, I finish off my skincare routine and go to bed. When I wake up the next morning, I can instantly feel how soft my skin is. I can hardly stop touching it, it feels so good. My skin looks a little plumper and has a more of a glow than the night before. In short, it did everything a good hydrating mask is supposed to do. Nothing more, nothing less. 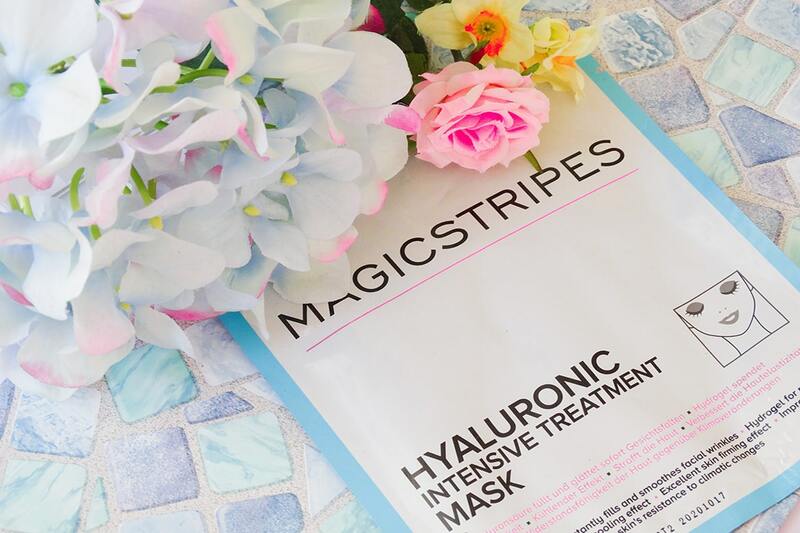 Magicstripes Hyaluronic Intensive Treatment Mask is a basic hydrating mask that does what it says on the tin: it hydrates skin, plumps it up and makes the complexion glow. 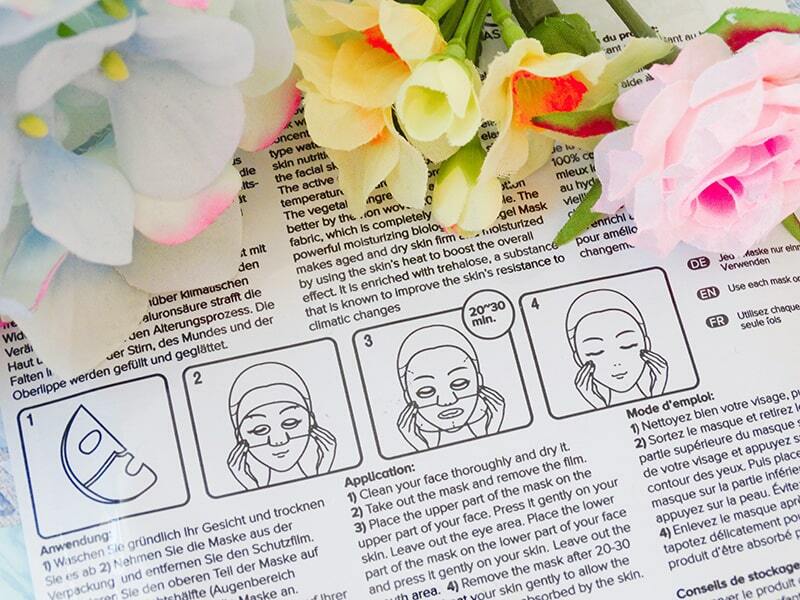 Have you tried Magicstripes Hyaluronic Intensive Treatment Mask? Share your thoughts in the comments below. Fatou, glad you enjoyed it.